Drs. 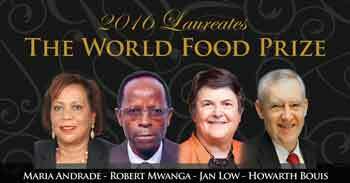 Maria Andrade, Robert Mwanga, Jan Low and Howarth Bouis were announced as the 2016 World Food Prize Laureates during a June 28 ceremony at the U.S. State Department. 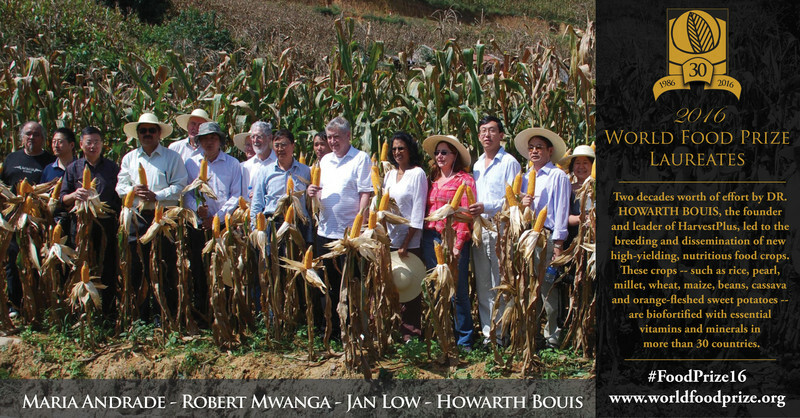 Dr. Howarth Bouis, the founder of HarvestPlus at the International Food Policy Research Institute (IFPRI), over a 25-year period pioneered the implementation of a multi-institutional approach to fortification as a global plant breeding strategy. As a result of his leadership, crops such as iron and zinc fortified beans, rice, wheat and pearl millet, along with Vitamin A-enriched cassava, maize and OFSP are being tested or released in over 40 countries. Thanks to the combined efforts of the four Laureates, over 10 million persons are now positively impacted by biofortified crops, with a potential of several hundred million more in the coming decades.